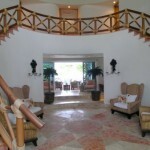 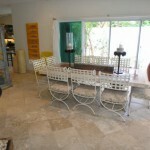 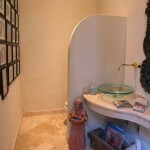 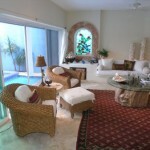 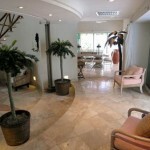 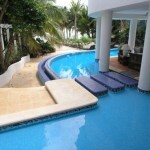 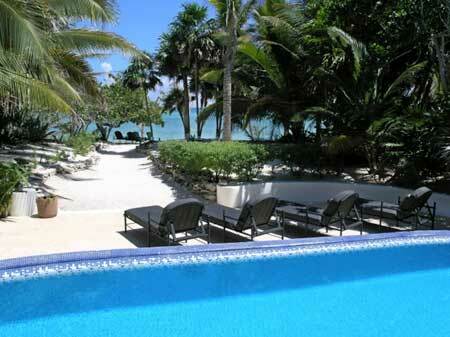 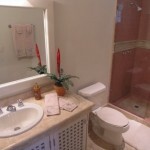 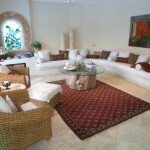 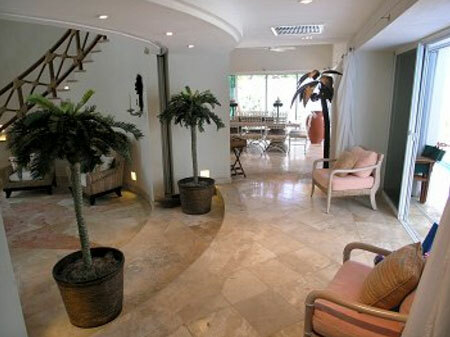 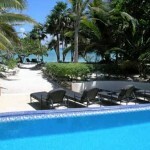 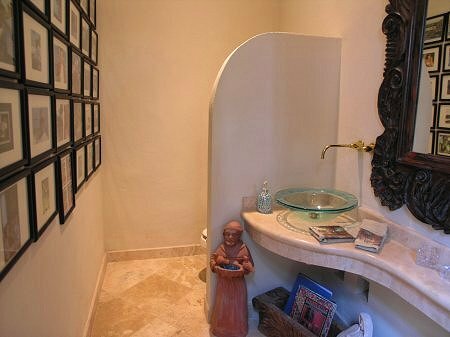 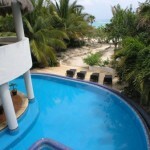 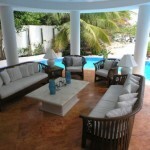 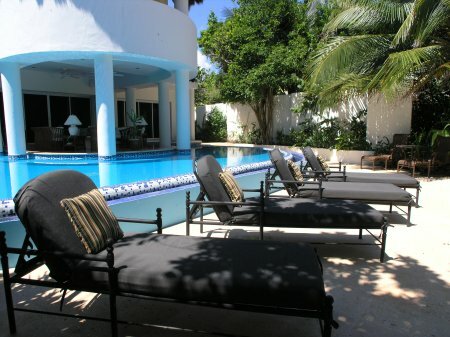 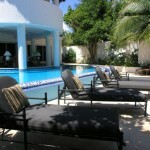 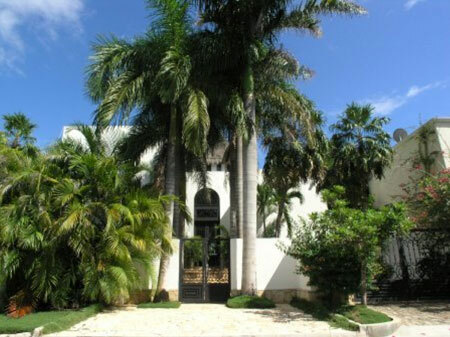 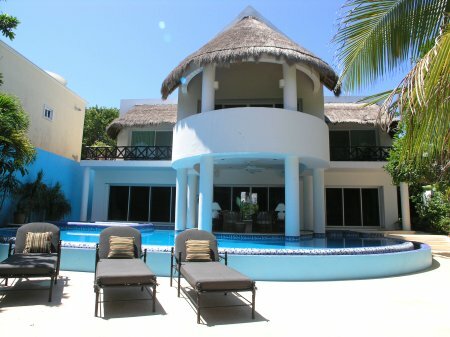 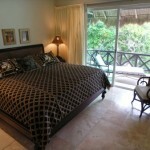 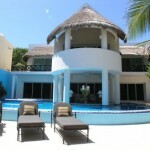 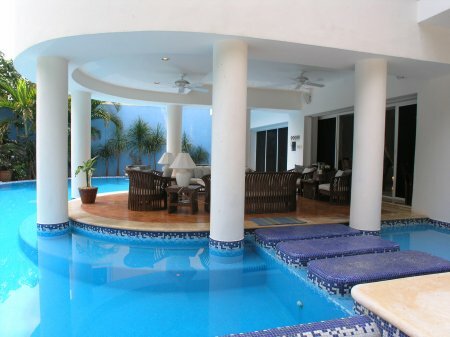 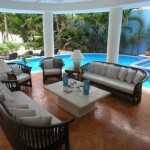 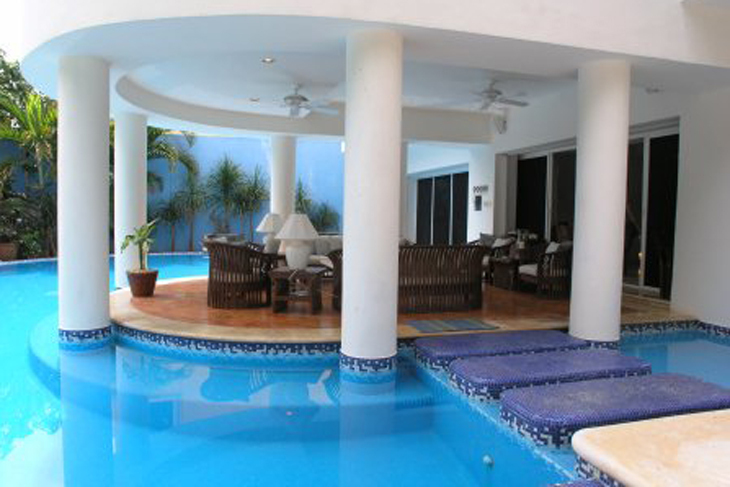 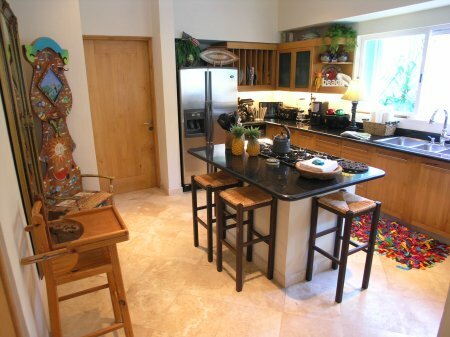 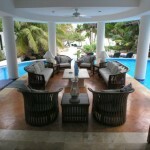 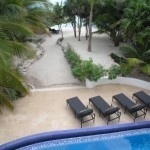 Ah Villa is one of the finest villas in all of Akumal, fronting beautiful South Akumal Bay and the Caribbean Sea. 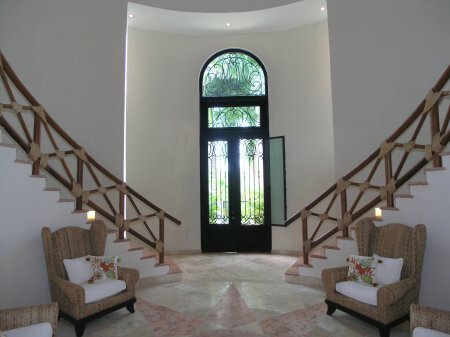 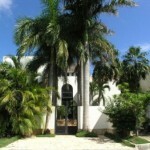 A short limestone walkway lined with Royal palms leads to the villa’s elegant wrought iron front doors. 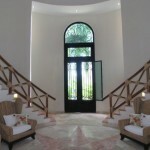 Inside, a circular entrance foyer with soaring 30-foot ceilings, and a pair of winding stairways with custom ‘roped wood’ railings, gracefully running up both sides, leads to the upper level bedrooms. 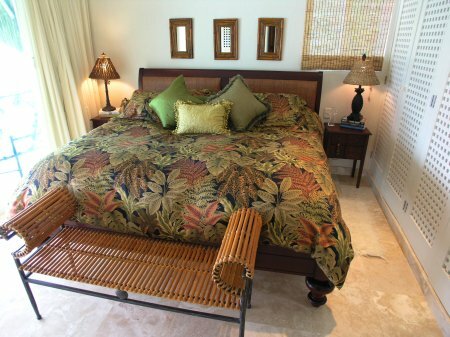 Tropical, wing back, wicker chairs invite you to stop, sit down for a moment, and take it all in! 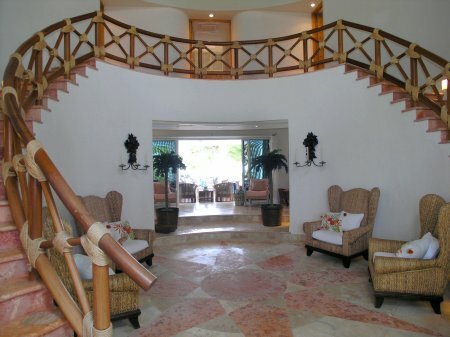 Once you pass through the foyer, most everything else is on the beach side of this villa, including all primary living spaces on the lower level, and all bedrooms on the upper level. 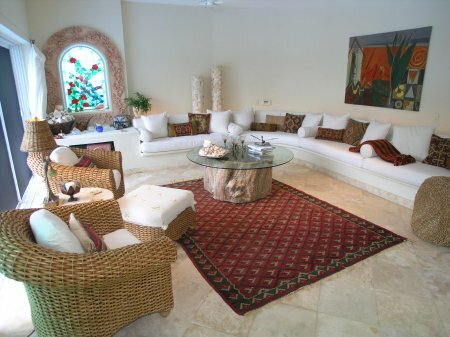 Just beyond the entrance foyer, on the right, is a spacious living room, comfortably furnished with plush wicker chairs, and an impressive, embedded couch that follows the curvature of the entire back wall. 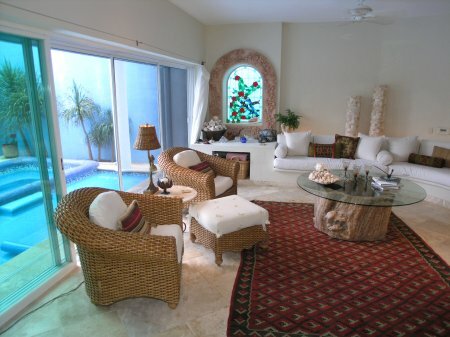 Glass sliders in the living room offer views of the pool and beach beyond. 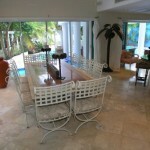 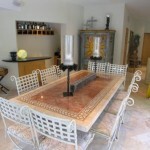 Across from the living room, on the opposite side of the villa, is the dining room, bar area and kitchen. 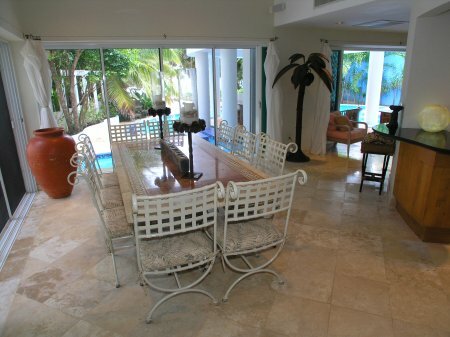 The dining room has the same marvelous view over the pool toward the beach with elegant seating for 10. 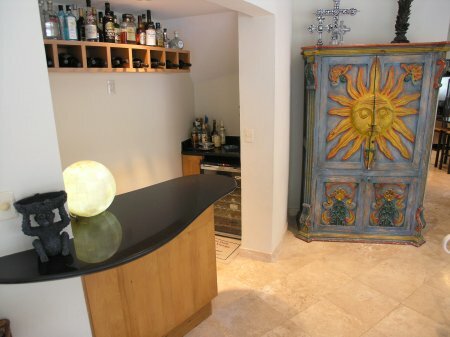 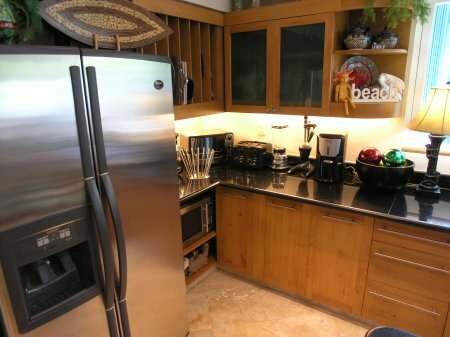 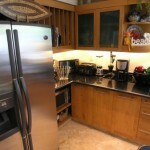 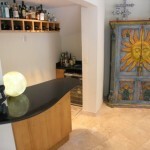 A nicely equipped bar is just behind with a black granite top and wine refrigerator. 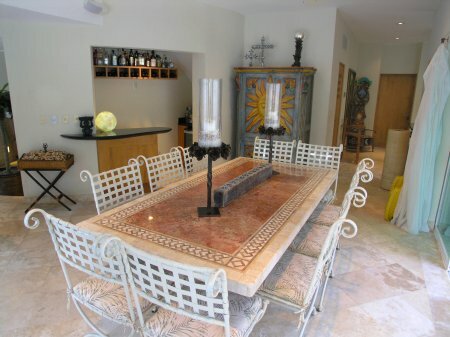 A beautifully hand carved/hand painted cabinet, along with floor vases and candles, give the dining room warmth with a local flair. 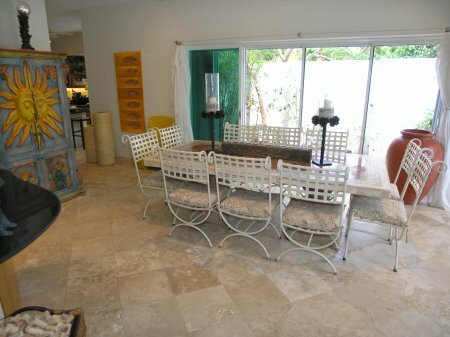 The dining table also serves as a buffet table for casual dining. 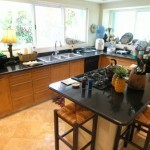 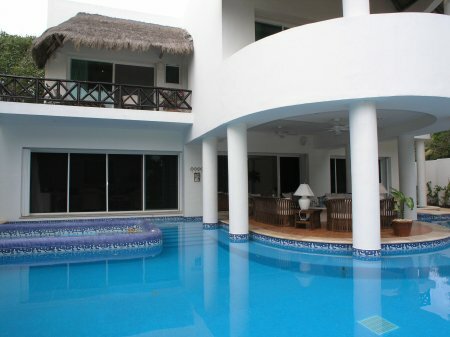 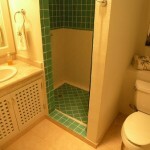 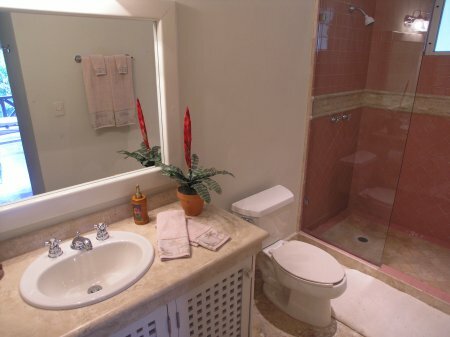 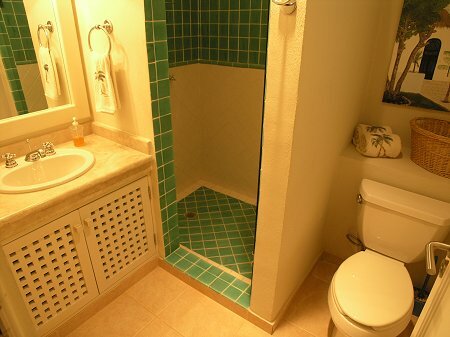 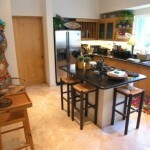 This is very convenient since the kitchen is on one side and the beach, pool and outdoor living room are on the other. 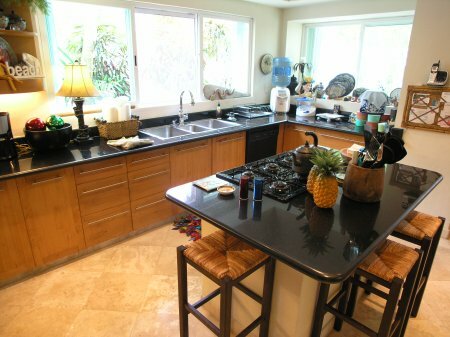 The kitchen is fully equipped with top quality stainless steel appliances, yes – even a dishwasher, granite counters and an island with bar stool seating; it’s the perfect kitchen for any chef, gourmet or novice. 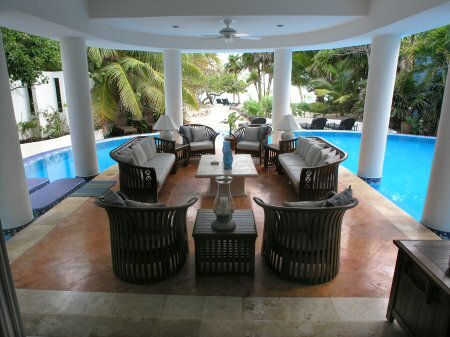 The outdoor living room is undeniably the heart of this luxury villa; perched on a peninsula, surrounded by an intricately designed, infinity edge swimming pool, with the beach and Caribbean as the backdrop; its perfect for cocktail hour, casual dining or just relaxing in this little slice of paradise! 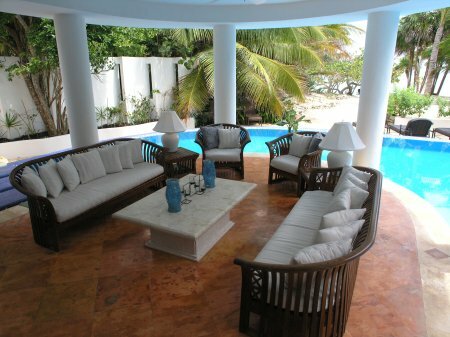 This outdoor living space has exquisite padded teak wood couches and chairs with matching end tables. 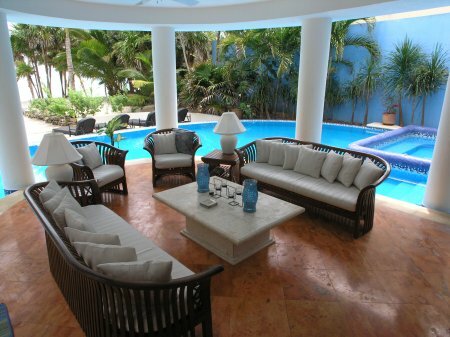 A central table is convenient for snacks and drinks making this a perfect place to sit and chat in the shade. 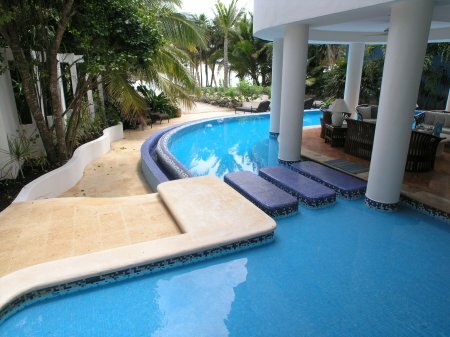 Three ‘island’ steps ‘through’ the pool and you’re on a path leading to a sunning patio, directly below the pool level and then the walkway changes to sand leading to the stunning beach of South Akumal. 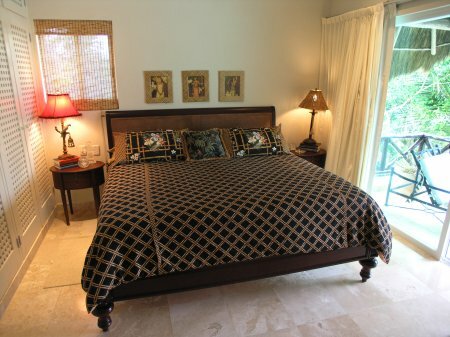 Three ocean view, air conditioned bedrooms are on the upper level, all with en-suite, marble bathrooms and king sized beds. 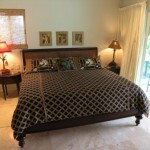 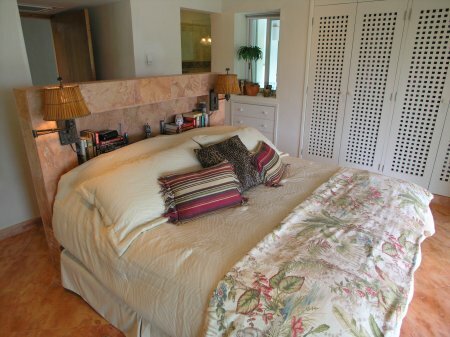 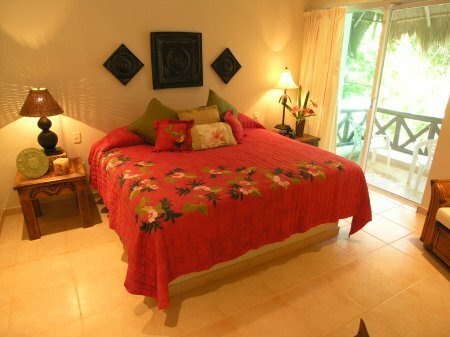 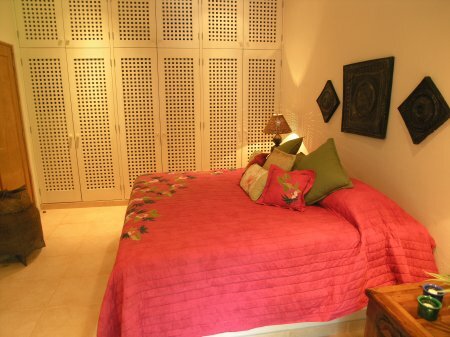 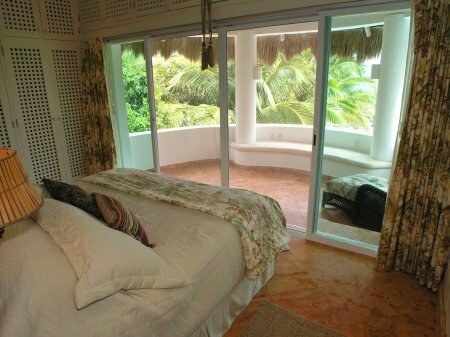 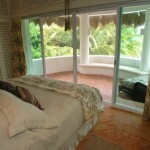 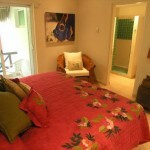 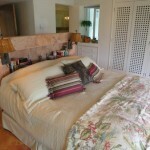 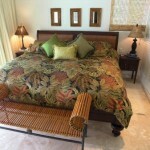 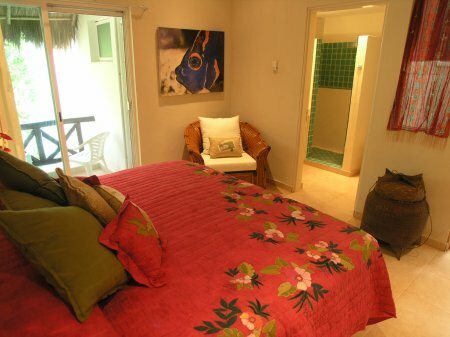 Each bedroom is exquisitely decorated in tropical patterns and textures that reflect the beauty of the Caribbean. 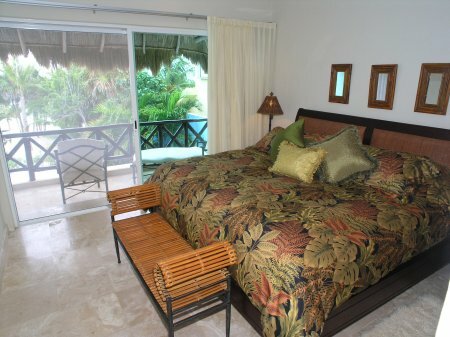 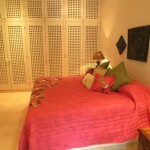 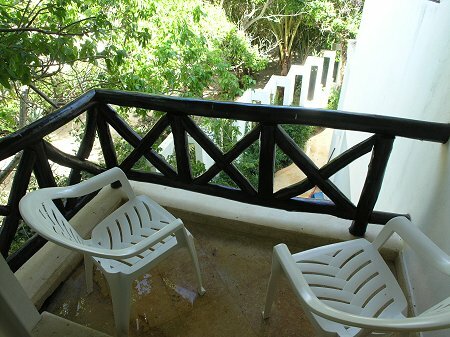 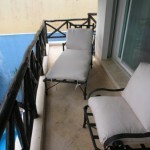 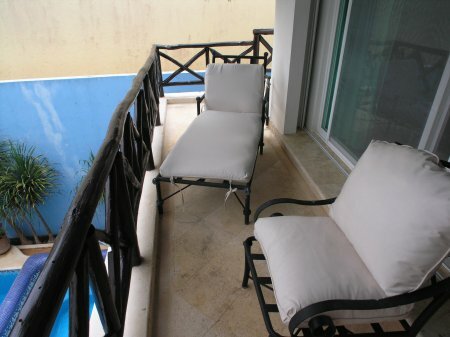 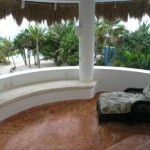 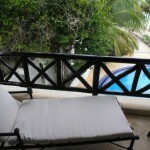 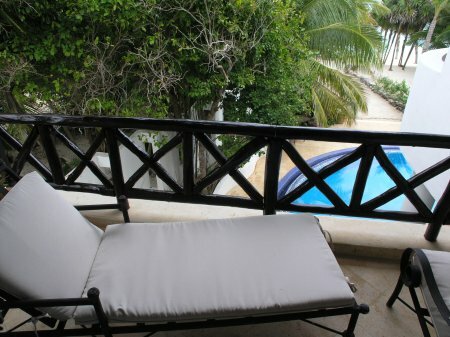 All of the bedrooms have furnished, private balconies. 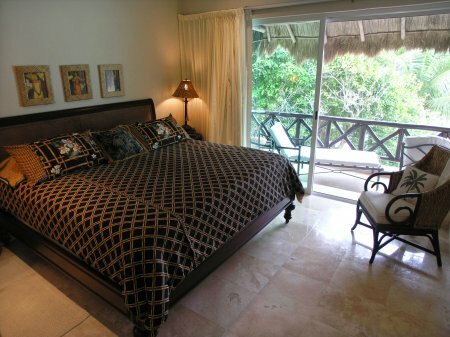 A fourth bedroom, also on the ocean side of the villa, has a separate, private entrance, air-conditioning, a king bed, en-suite bathroom and balcony overlooking the pool. 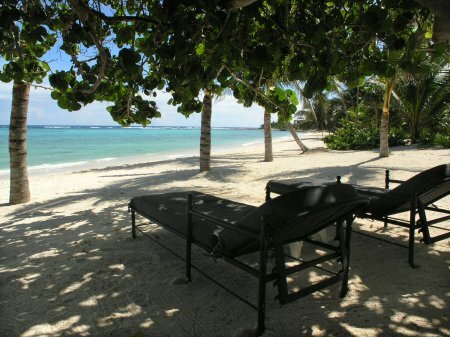 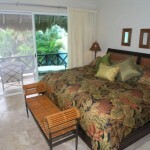 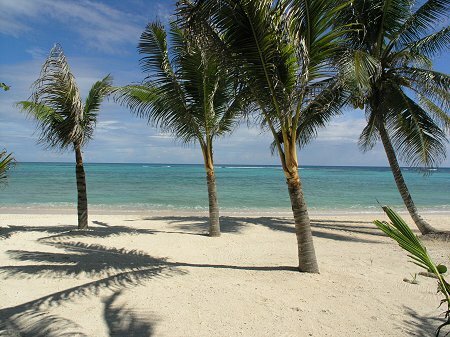 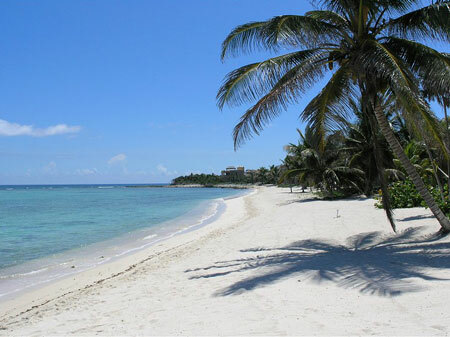 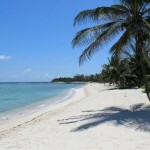 South Akumal is a quiet, gated, residential community and is the perfect setting for a beachfront, family vacation. 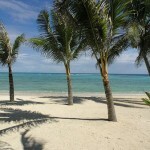 The bay has a sheltering reef to block the surf, keeping the bay calm, which is great for snorkeling and kayaking. 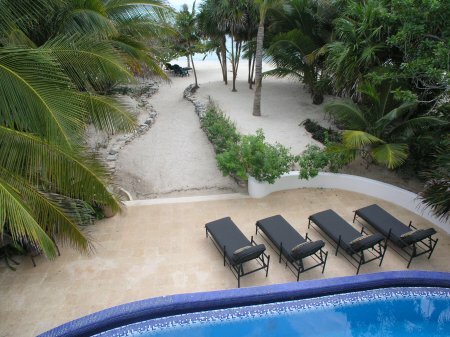 Two kayaks are waiting at the villa to be taken for a spin around the bay. 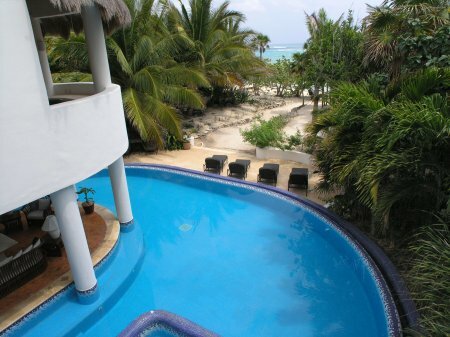 With all of the natural beauty here, you will be rejuvenated! 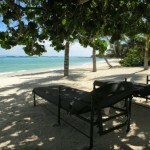 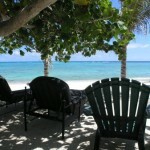 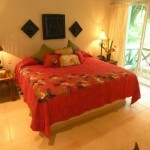 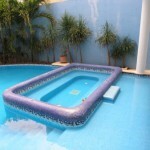 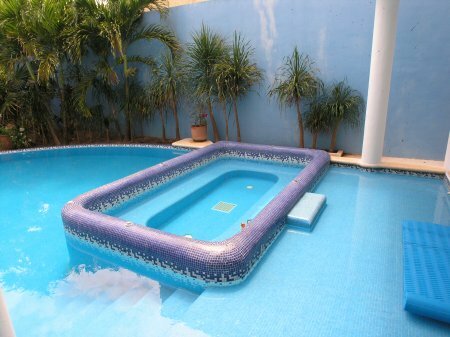 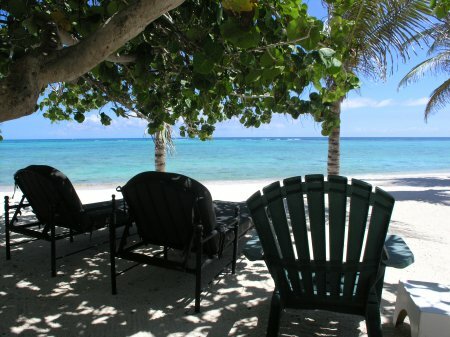 Rates are in USD per night, holidays per week, for up to 8 people. 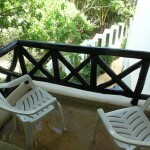 Minimum stays: Holidays 7 nights. 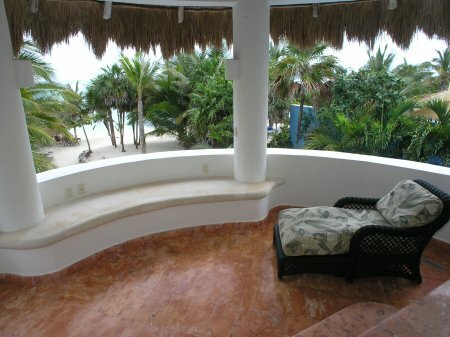 The rest of the year 4 nights.